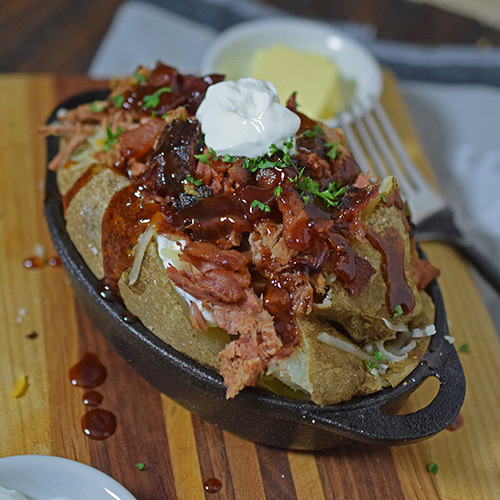 One of my favorite ways to use leftover smoked pork or brisket is to use it for a loaded baked potato. Cheesy, smoky, salty, and sweet - a Hawg Back will fill you up. This dish appears on the menus of many BBQ joints because they are delicious and filling. The biggest reason is that it helps them "re-work" leftover BBQ into a new dish, minimizing product loss. 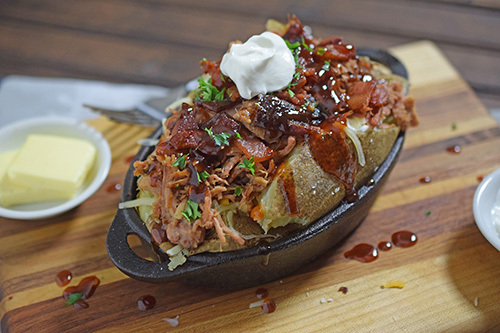 The might just be called "BBQ stuffed potato" or "BBQ loaded potato." But many joints come up with names to set them apart, such as; The Heavyweight, The Big Poppa, or a Chop Baker. The first one that I ever had was from Buddy's BBQ in Knoxville. They call theirs Hawg Back Potatoes and that name has stuck with me. 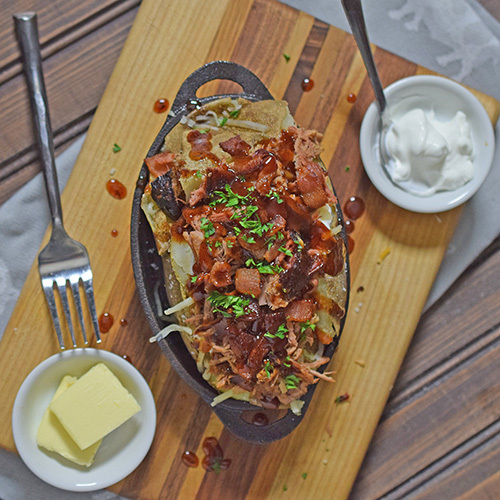 The ingredients vary somewhat, but the basic is a large baked potato, smoked pork, cheddar cheese, BBQ Sauce, and sour cream. I consider these to be an entree, not a side dish or appetizer. I made these last night using some of our leftover smoked pork that we froze after a BBQ contest last year. Preheat grill (indirect heat) or oven to 425°f. I used a Large Big Green Egg with a plate setter (aka Conveggtor) and natural hardwood lump coal. Bake the potatoes. I lightly coat each baker with canola oil and then season each with coarse kosher salt. Wrap them with foil and put them in the grill/oven until tender when you squeeze them, about 1 hour 15 minutes. Prepare the potatoes. Remove potatoes from the foil, cut an "X" across the top of the potatoes and press in on the sides to open them up. Assemble the potatoes. Add 1-2 tablespoons of unsalted butter. Top each with 1/2 cup cheese and one half cup pork. Sprinkle bacon on top. Drizzle BBQ sauce over all of this. Season with the BBQ seasoning. Top with a dollop of sour cream and serve. You can garnish these with chives, green onion, or parsley. 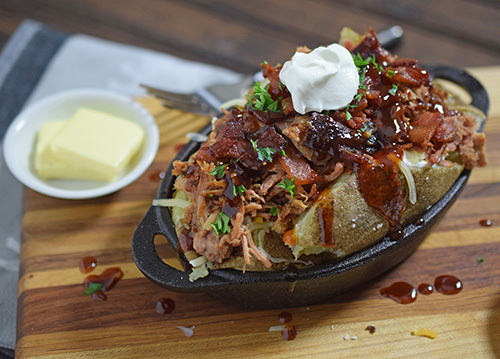 One heck of a way to enjoy BBQ leftovers! You can also make these with leftover brisket, chicken, or chili. Enjoy!